Watch classics like "Santa Claus is Comin' to Town," perennial favorites like "Dr. Seuss' How the Grinch Stole Christmas" and five "Toy Story" movies. Maybe you don't have the perfect gifts for everyone yet or the lights untangled and working, but with the help of Freeform's "25 Days of Christmas" marathon, you can plan your holiday family movie nights. The annual marathon of holiday movies on Freeform (formerly known as "ABC Family") begins Dec. 1 and continues through Christmas. Find your Freeform channel by clicking here. 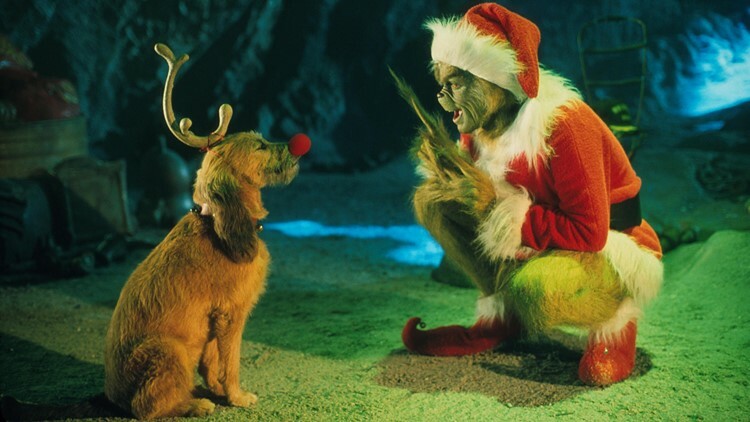 You'll find classics like "Santa Claus is Comin' to Town," perennial favorites like "Dr. Seuss’ How the Grinch Stole Christmas" with Jim Carrey and a few new movies, like "Life-Size 2: A Christmas Eve" starring Tyra Banks. This year's lineup also includes a slew of animated films, including five movies from the "Toy Story" series. There is usually more than one showing of each movie. So if you miss it once, check to see if it's on again. But that's not the case with every movie. If you have a child that really wants to see "The Doc McStuffins Christmas Special," for example, make sure to record it or view it live. It's only on once. 7 a.m. "Santa Paws 2: The Santa Pups"
9:05 a.m. "Home Alone 3"
11:15 a.m. "The Wonderful World of Disney: Magical Holiday Celebration"
1:15 p.m. "Richie Rich’s Christmas Wish"
3:20 p.m. "Christmas with the Kranks"
5:25 p.m. "The Santa Clause 3: The Escape Clause"
7:35 p.m. "The Nightmare Before Christmas"
9:15 p.m. "Dr. Seuss’ How the Grinch Stole Christmas"
7 a.m. "Home Alone 3"
9 a.m. "Eight Crazy Nights"
11 a.m. "Richie Rich’s Christmas Wish"
1:05 p.m. "Mickey’s Once Upon a Christmas"
4:40 p.m. "The Nightmare Before Christmas"
6:20 p.m. "Dr. Seuss’ How the Grinch Stole Christmas"
7 a.m. "Mickey’s Once Upon a Christmas"
8:30 a.m. "Winnie the Pooh and Christmas Too"
11 a.m. "Decorating Disney: Holiday Magic"
12 p.m. "The Truth About Christmas"
5:25 p.m. "Life-Size 2: A Christmas Eve"
7:25 p.m. "The Santa Clause"
12 a.m. "The Family Stone"
Actors Elizabeth Mitchell and Tim Allen act in a scene on the set of their upcoming film, 'Mrs. Clause: The Santa Clause 2' February 28, 2002 in Vancouver, British Columbia. 7 a.m. "Decorating Disney: Holiday Magic"
8 a.m. "Pop Up Santa Holiday Special"
11:30 a.m. "Love the Coopers"
2:05 p.m. "The Family Stone"
6:50 p.m. "The Santa Clause"
8:55 p.m. "The Santa Clause 3: The Escape Clause"
12 a.m. "Home Alone 3"
9 a.m. "Mickey’s Christmas Carol"
12 p.m. "Home Alone 3"
2 p.m. "Richie Rich’s Christmas Wish"
4:05 p.m. "Santa Claus Is Comin’ to Town"
5:10 p.m. "The Nightmare Before Christmas"
6:50 p.m. "The Santa Clause 3: The Escape Clause"
8:55 p.m. "Christmas with the Kranks"
7 a.m. "Mickey’s Christmas Carol"
7:30 a.m. "Santa Paws 2: The Santa Pups"
12 p.m. "Richie Rich’s Christmas Wish"
2:05 p.m. "Santa Claus Is Comin’ to Town"
3:10 p.m. "The Nightmare Before Christmas"
4:50 p.m. "Christmas with the Kranks"
6:55 p.m. "Disney Pixar's Toy Story"
8:55 p.m. "Disney Pixar's Toy Story 2"
12 a.m. "Call Me Claus"
7:30 a.m. "Jingle All the Way 2"
11 a.m. "Call Me Claus"
3:15 p.m. "Disney Pixar's Toy Story"
5:15 p.m. "Disney Pixar's Toy Story 2"
7:20 p.m. "Disney Pixar's Toy Story 3"
9:50 p.m. "Disney’s A Christmas Carol"
7:30 a.m. "Winnie the Pooh and Christmas Too"
8 a.m. "A Belle for Christmas"
12:15 p.m. "Deck the Halls"
2:20 p.m. "Disney’s A Christmas Carol"
4:25 p.m. "Santa Claus Is Comin’ to Town"
5:30 p.m. "Disney Pixar's Toy Story 3"
8 p.m. "Disney’s Fairy Tale Weddings: Holiday Magic"
9 p.m. "The Santa Clause"
11 p.m. "The Santa Clause 3: The Escape Clause"
1 a.m. "Disney’s Fairy Tale Weddings: Holiday Magic"
7 a.m. "Winnie the Pooh and Christmas Too"
7:30 a.m. "Deck the Halls"
9:30 a.m. "Santa Claus Is Comin’ to Town"
12:40 p.m. "Life-Size 2: A Christmas Eve"
2:45 p.m. "Christmas with the Kranks"
4:50 p.m. "The Santa Clause"
6:55 p.m. "The Santa Clause 3: The Escape Clause"
9 p.m. "Dr. Seuss’ How the Grinch Stole Christmas"
11:35 p.m. "Love the Coopers"
11 a.m. "Disney’s Fairy Tale Weddings: Holiday Magic"
12 p.m. "Love the Coopers"
2:35 p.m. "Richie Rich’s Christmas Wish"
12 a.m. "Holiday in Handcuffs"
11 a.m. "Pop Up Santa Holiday Special"
12:35 p.m. "Richie Rich’s Christmas Wish"
2:40 p.m. "The Nightmare Before Christmas"
4:20 p.m. "Jingle All the Way 2"
6:25 p.m. "Ice Age: Continental Drift"
8:30 p.m. "Disney Pixar's Finding Nemo"
12 a.m. "Beethoven’s Christmas Adventure"
Andrea Bocelli sings prior to the World Film Premiere of Disney's 'A Christmas Carol' at the Odeon Leicester Square on November 3, 2009 in London, England. 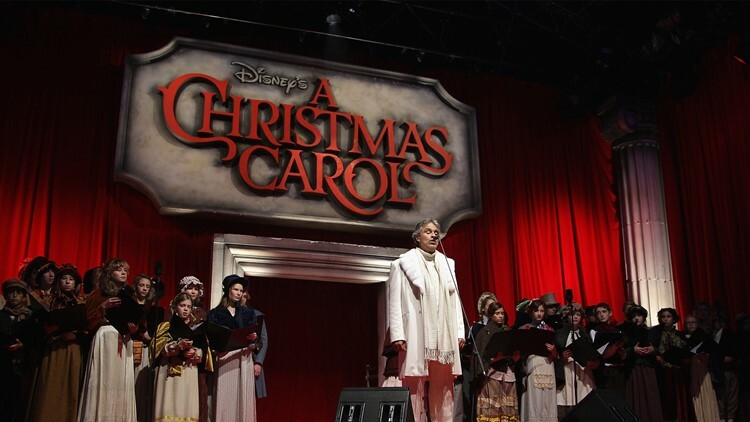 7 a.m. "Beethoven’s Christmas Adventure"
11:30 a.m. "Jingle All the Way 2"
1:30 p.m. "Mickey’s Once Upon a Christmas"
3 p.m. "Mickey’s Twice Upon a Christmas"
4:30 p.m. "Ice Age: Continental Drift"
6:30 p.m. "Disney Pixar's Finding Nemo"
9 p.m. "Disney’s A Christmas Carol"
7 a.m. "Call Me Claus"
11 a.m. "No Sleep ‘Til Christmas"
3:40 p.m. "Holiday in Handcuffs"
8:55 p.m. "The Santa Clause"
12 a.m. "Deck the Halls"
7 a.m. "The Family Stone"
3:10 p.m. "Christmas with the Kranks"
5:15 p.m. "Deck the Halls"
7:20 p.m. "The Santa Clause"
9:25 p.m. "The Santa Clause 3: The Escape Clause"
11:30 p.m. "The Family Stone"
7:30 a.m. "Mickey’s Once Upon a Christmas"
9 a.m. "Mickey’s Twice Upon a Christmas"
10:30 a.m. "Christmas with the Kranks"
12:35 p.m. "The Santa Clause 3: The Escape Clause"
2:40 p.m. "Disney Pixar's Toy Story"
4:40 p.m. "Disney Pixar's Toy Story 2"
6:45 p.m. "Disney Pixar's Toy Story 3"
11:55 p.m. "Life-Size 2: A Christmas Eve"
7 a.m. "A Belle for Christmas"
9 a.m. "Jingle All the Way 2"
11 a.m. "Santa Claus Is Comin’ to Town"
12 p.m. "Disney Pixar's Toy Story"
2 p.m. "Disney Pixar's Toy Story 2"
4:05 p.m. "Disney Pixar's Toy Story 3"
6:35 p.m. "Dr. Seuss’ How the Grinch Stole Christmas"
9:15 p.m. "Disney’s A Christmas Carol"
1 p.m. "Richie Rich’s Christmas Wish"
3:05 p.m. "Deck the Halls"
5:10 p.m. "Disney’s A Christmas Carol"
7:15 p.m. "The Nightmare Before Christmas"
12 a.m. "Richie Rich’s Christmas Wish"
7:30 a.m. "Mickey’s Christmas Carol"
8 a.m. "Call Me Claus"
10 a.m. "The Nightmare Before Christmas"
1:35 p.m. "Christmas with the Kranks"
3:40 p.m. "The Truth About Christmas"
12 a.m. "12 Dates of Christmas"
Catch Jim Carrey in "Dr Seuss ' How the Grinch Stole Christmas" in Freeform's "25 Days of Christmas" line-up. 9 a.m. "Snow 2: Brain Freeze"
11 a.m. "The Family Stone"
1 p.m. "Disney’s Fairy Tale Weddings: Holiday Magic"
5:05 p.m. "The Santa Clause"
7:10 p.m. "The Santa Clause 3: The Escape Clause"
9:15 p.m. "Disney Pixar's The Incredibles"
7 a.m. "Pop Up Santa Holiday Special"
8:30 a.m. "Mickey’s Once Upon a Christmas"
10 a.m. "Mickey’s Twice Upon a Christmas"
1:30 p.m. "Life-Size 2: A Christmas Eve"
3:30 p.m. "The Santa Clause 3: The Escape Clause"
5:35 p.m. "Santa Claus Is Comin’ to Town"
6:40 p.m. "Disney Pixar's The Incredibles"
9:20 p.m. "Ice Age: Continental Drift"
11:25 p.m. "Life-Size 2: A Christmas Eve"
1:30 a.m. "Mickey’s Christmas Carol"
8:30 a.m. "Mickey’s Twice Upon a Christmas"
10:30 a.m. "Winnie the Pooh and Christmas Too"
11 a.m. "Mickey’s Christmas Carol"
11:30 a.m. "Santa Claus Is Comin’ to Town"
12:30 p.m. "Love the Coopers"
3 p.m. "Ice Age: Continental Drift"
11:55 p.m. "No Sleep ‘Til Christmas"
7 a.m. "A Miracle on Christmas Lake"
9:40 a.m. "The Santa Clause"
11:50 a.m. "The Santa Clause 3: The Escape Clause"
1:55 p.m. "Disney Pixar's Toy Story That Time Forgot"
2:25 p.m. "Disney’s Prep & Landing"
2:55 p.m. "Disney’s Prep & Landing: Naughty vs. Nice"
3:25 p.m. "The Nightmare Before Christmas"
5:05 p.m. "Dr. Seuss’ How the Grinch Stole Christmas"
7:45 p.m. "The Santa Clause"
9:50 p.m. "The Santa Clause 3: The Escape Clause"
11:55 p.m. "Christmas with the Kranks"
7:30 a.m. "Beethoven’s Christmas Adventure"
9:40 a.m. "Richie Rich’s Christmas Wish"
11:45 a.m. "Disney Pixar's Toy Story That Time Forgot"
12:15 p.m. "Santa Claus Is Comin’ to Town"
1:20 p.m. "The Nightmare Before Christmas"
3 p.m. "Christmas with the Kranks"
7:30 a.m. "Richie Rich’s Christmas Wish"
11 a.m. "Mickey’s Twice Upon a Christmas"
12:30 p.m. "The Nightmare Before Christmas"
2:05 p.m. "Jingle All the Way 2"
4:10 p.m. "Disney’s A Christmas Carol"
6:15 p.m. "Dr. Seuss’ How the Grinch Stole Christmas"
12 a.m. "The Santa Clause 3: "The Escape Clause"
7 a.m. "Disney’s Prep & Landing"
7:30 a.m. "Disney’s Prep & Landing: Naughty vs. Nice"
8 a.m. "Mickey’s Twice Upon a Christmas"
11 a.m. "The Nightmare Before Christmas"
12:40 p.m. "Disney’s A Christmas Carol"
2:40 p.m. "Christmas with the Kranks"
4:45 p.m. "The Santa Clause"
12 a.m. "Disney’s The Lion King II: Simba’s Pride"